Sedans haven't faired well in our Fantasy Garage. Currently, there aren't any. Once there were two (the Phaeton W12 and the Quattroporte), but you kids gave both the proverbial boot. Some might argue the Audi RS4 Avant would qualify, but this is a clear case of five doors being more equal than four. No, the only four-door we're currently packing is the Lamborghini LM002. And if that's a sedan, my aunt's an uncle. That said, I'll feel like a downright failure if we fill the Garage and it contains no sharp-dressed sedans. That's why today's nominee, the indomitable Mercedes-Benz 6.9, gets the nod. 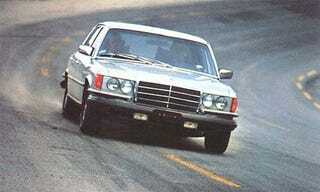 The car's full name is Mercedes-Benz 450 SEL 6.9, though no one bothers with the 450SEL part. In fact, you can just drop the MB out of the title altogether — 6.9 by itself will suffice. The 6.9 is part of that elite group of cars known simply by their alphanumerics (or, in this case pure numerics). F40. M1. 959. ZR-1. Even a car as fully fly as the M5 doesn't qualify without the the chassis number (e.g. E39). (Which Corvette Z06, for instance?) But 6.9 can mean nothing but a 6.9. Also, with the exception of the wider tires, the only way to tell a 6.9 apart from its baser 450 SEL brethren is a metallic badge on the trunk. Compare that level of stealth with today's badge-festooned über-sedans, all of which look like wolves in shark costumes. Of course you could always select factory option 261 and delete the badge, which is the correct way to fly. And fly the 6.9 did! But before we get to the specifics, consider what the 6.9 means to pistonhead culture. Sinatra, Telly Savalas and the Shah of Iran each owned one, as did JFK Jr. We've all seen Frankenheimer's Ronin 13-dozen times and therefore all know the director of Grand Prix used both an M5 and an S8 for his magnum auto opus. But what car from Stuttgart could hold its own against the best from Munich and Ingolstadt in one of the greatest odes to the car ever filmed? Only one, really. Too bad they had to add in the fake tire smoke. Even more fantastic, after 30 years, Claude Lelouch has finally admitted the car on whose bumper he strapped a camera to film C'était un rendez-vous was none other than a 6.9. For decades, peeps (me included) believed the car tearing through the guts of Paris was in fact a Ferrari 275 GTB. If you walk into the Peterson Automotive Museum today you will find a video of Rendez-vous playing next to a Ferrari 275 GTB/4 with a sign proclaiming its use in the film. Sure, Lelouch did dub in the soundtrack from a Ferrari, but for a big ole two-ton sedan to pull off a Ferrari impersonation for 30 years? Well, that's about as good as a car with extra doors gets. What makes the 6.9 so gosh darn hot? Like all great cars, we'll start with history. In 1966 an engineer named Erich Waxenberger decided to stuff the M100 V8 from the fab MB 600 limousine (owned by both John Lennon and the Pope) into a W109 S-Class chassis. In doing so, he created the world's first Q-Car. This was a watershed moment. While practically everyone gets the appeal of, to quote Brock Yates, "American dim-bulb street racer variety," muscle cars (think McConaughey in Dazed and Confused) it takes a more sophisticated palette to understand just how friggin' right-on a stonking motor in a stock looking sedan is. And Mr. Waxenberger's 6.3 started it all. The 6.3 was produced from 1968 until the oil crisis of 1973, when Daimler-Benz killed it. Make no mistake, the 6.3 was a hell of a car; so much so that I almost put it to a vote against the 6.9. But, after much pondering, I decided the 6.9 is just that much better. In European trim, the big 6.9-liter mill cranked out 286 horsepower and 405 lb-ft or torque (the Malaise Era US version got its wings clipped to the tune of just 250 horses and 360 torques). If you can set your mental time machines back 30 years and reread the previous sentence, smoke will billow out of your ears. In 1977 a Corvette was limping up 219 hp and 255 lb-ft of twist. A Ferrari 308 GTS? You don't even want to know (205 hp and 181 lb-ft). Only the really exotic stuff (Countach, Aston Martin V8 Vantage, Ferrari 512 BB) was making more power and only 18-wheelers produced as much torque. Yet unlike American muscle of the time, the engine wasn't simply big. Sure, the 6.9 sported a bored out lightweight V8, but you know those Germans. The exhaust valves were sodium filled, the intake valves were nitrided and all featured chrome stems. The engine was fully dry-sumped (using over 12 quarts of oil!) because that was the only way to give the car proper ground clearance, for the big old engine block dropped further down than the centerline of the crank. The cylinder heads were aluminum and the valve lifters were hydraulic. I estimate that there aren't a dozen production sedans in the world that could be driven really hard for 10 laps or 25 miles around Road Atlanta without suffering severe mechanical ailments. ... It was over in one hour and twenty minutes, with an average speed just over 72 mph. The car rolled into the pits and aside from a slight, completely normal hissing sound as the hydropneumatic suspension readjusted itself, the 6.9 was behaving as if nothing had happened — much like a strong, young thoroughbred after an early morning exercise. This incredible machine had just been flogged for 100 miles on one of the most rigorous stretches of road to be found anywhere and it was now appearing to shrug its shoulders and await the next challenge! Barring a slight scuffing on the left side tires - owing to the predominance of right hand corners at Road Atlanta, and some black flecks of brake lining on its alloy wheels, the 6.9 looked as if it had just returned from a low speed tour through Central Park. Massive power, utter stealth and the ability to turn 100 miles on one of the America's toughest tracks into a stroll in the park is the stuff they make dreams out of. Yates goes on to explain that he was hitting around 125 mph on the back straight. I remember just barely being able to get a 400 horsepower Maserati to 125 mph on that same straight. $40,000 is a good chunk of change for a car today. In 1977, that was a few dollars more than a Rolls-Royce and more than twice what a Jaguar cost. It also happens to be the price Mercedes wanted for a 6.9. Was it worth the money? Not only will we answer yes, but we want one in the Fantasy Garage. Happy voting.